Venus, the goddess of love, and her lover Adonis meet each other's eyes, their bodies still half entwined. Holding his spear, the young mortal Adonis sits upright, anxious to be off to the hunt while his dog waits patiently at his side. Venus touches his shoulder, imploring him not to go. In so doing, she reclines slightly backwards as if to pull him closer. To her left a pair of doves, Venus's attribute, symbolize love and constancy. Paintings like this one were popular with sophisticated art patrons in Paris, where Simon Vouet returned in 1627 after spending years in Rome. 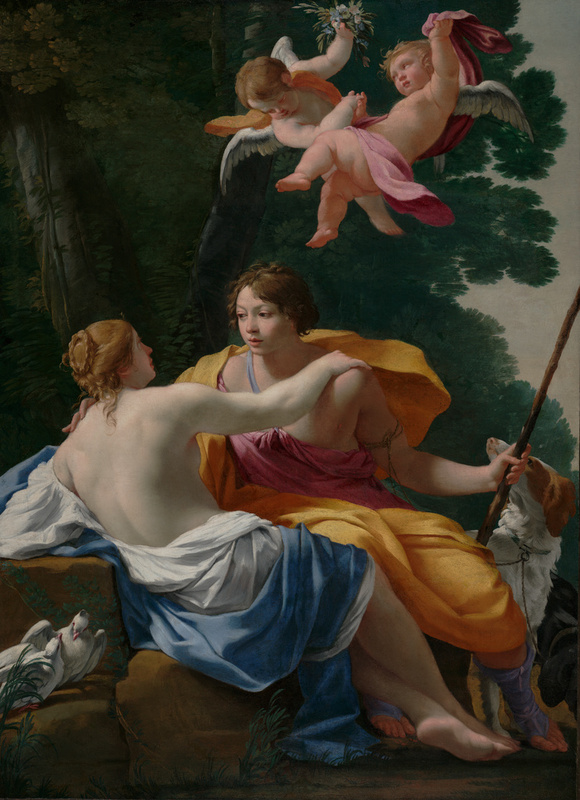 He absorbed the lessons of Italian Baroque painting and continued to use bright, decorative colors; Adonis wears a yellow-gold robe over a fuchsia-colored tunic and lavender sandals, and Venus is partially clad in a white undergarment and a subdued violet-blue robe. Her creamy white skin contrasts with the darker, smooth skin of Adonis, here depicted as an adolescent with rosy cheeks and a bud-like mouth. Baron Robert de Gendébien (Brussels, Belgium), sold to Frederick Mont, Inc.
Frederick Mont, Inc. (New York, New York), sold to the J. Paul Getty Museum, 1971. Crelly, W.R. The Painting of Simon Vouet (New Haven and London: Yale University Press, 1962), p. 205, no. 118. Fredericksen, Burton B. Catalogue of the Paintings in the J. Paul Getty Museum (Malibu: J. Paul Getty Museum, 1972), p. 94, no. 126. The J. Paul Getty Collection, exh. cat. (Minneapolis: Minneapolis Institute of Arts, 1972), unpaginated, no. 53, ill.
Baroque Masters from the J. Paul Getty Museum, exh. cat. (Northridge: California State University, 1973), p. 30, no. 38, ill.
Bordeaux, Jean-Luc. "The J. Paul Getty Museum: La peinture française." Connaissance des arts, no. 278 (April 1975), pp. 82, 84, ill.
Fredericksen, Burton B., ed. The J. Paul Getty Museum: Greek and Roman Antiquities, Western European Paintings, French Decorative Arts of the Eighteenth Century (Malibu: J. Paul Getty Museum, 1975), pp. 71, 123, ill.
Fredericksen, Burton B., et al. Guidebook: The J. Paul Getty Museum. 3rd ed. (Malibu: J. Paul Getty Museum, 1976), p. 68. Fredericksen, Burton B., Jiří Frel, and Gillian Wilson. Guidebook: The J. Paul Getty Museum. 4th ed. Sandra Morgan, ed. (Malibu: J. Paul Getty Museum, 1978), p. 87. Fredericksen, Burton B. Masterpieces of Painting in the J. Paul Getty Museum (Malibu: J. Paul Getty Museum, 1980), unpaginated, no. 43, ill.
Fredericksen, Burton B., Jiří Frel, and Gillian Wilson. The J. Paul Getty Museum Guidebook. 5th ed. (Malibu: J. Paul Getty Museum, 1980), p. 81. Boeckh, Hans. "Emailmalerei auf Genfer Taschenuhren vom 17. bis zum beginnenden 19. Jahrhundert." Inaugural diss. (Albert-Ludwigs Universität, 1982), p. 116. Rosenberg, Pierre, ed. France in the Golden Age: Seventeenth-Century French Paintings in American Collections, exh. cat. (New York: Metropolitan Museum of Art, 1982), p. 376, ill.
Rosenberg, Pierre, and John Pope-Hennessy. La peinture française dans les collections américaines, exh. cat. (Paris: Galeries nationales du Grand Palais, 1982), p. 376, ill.
Wright, Christopher. The French Painters of the Seventeenth Century (London: Orbis, 1985), p. 275. Thuillier, Jacques, et al. Vouet, exh. cat. (Paris: Réunion des musées nationaux, 1990), pp. 324-25, cat. 57, ill.
Lavergnée, Arnauld de. "Paris: Vouet at the Grand Palais." The Burlington Magazine 133, no. 1055 (February 1991), pp. 137, 138, 139. Marandel, J. Patrice. "The Guiltless Pleasures of Simon Vouet." The Journal of Art 4 (January 1991), p. 30. Serebriannaja, Natalia. "Les tableaux de Simon Vouet et de François Perrier conservés au musée de l'Ermitage." In Simon Vouet: Actes du colloque [...] Grand Palais, 5-7 février 1991. Stéphane Loire, ed. (Paris: Documentation Française, 1992), p. 81. Jaffé, David. Summary Catalogue of European Paintings in the J. Paul Getty Museum (Los Angeles: J. Paul Getty Museum, 1997), p. 133, ill.
Fredericksen, Burton B., et al. Masterpieces of the J. Paul Getty Museum: Paintings (Los Angeles: J. Paul Getty Museum, 1997), pp. 76-77, no. 41, ill., entry by Denise Allen. Mai, Ekkehard, and Ursula Weber-Woelk, eds. Faszination Venus: Bilder einer Göttin von Cranach bis Cabanel, exh. cat. (Cologne: Wallraf-Richartz-Museum, with Snoeck-Ducaju, 2000), pp. 312-13, no. 40, ill., entry by Claudia Denk. Weber-Woelk, Ursula. "Venus in Frankreich: Zu Venus-Darstellungen von Simon Vouet und seinem Kreis." In Faszination Venus: Bilder einer Göttin [...], exh. cat. Ekkehard Mai and Ursula Weber-Woelk, eds. (Cologne: Wallraf-Richartz-Museum, with Snoek-Ducaju, 2000), p. 136, fig. 5. Mai, Ekkehard, et al., eds. Venus: Bilder einer Göttin, exh. cat. (Munich: Alte Pinakothek, 2001), pp. 195-96, no. 28, ill., entry by Claudia Denk. Wine, Humphrey. The Seventeenth Century French Paintings (London: National Gallery, 2001), p. xxii, ill.
Allen, Denise, et al. Masterpieces of Painting in the J. Paul Getty Museum. Rev. ed. (Los Angeles: J. Paul Getty Museum, with Thames & Hudson, 2003), pp. 72-73, no. 38, ill., entry by Denise Allen. Pérouse de Monclos, Jean-Marie. L'Art de France de la Renaissance au siècle des Lumières: 1450-1770 (Paris: Mengès, 2004), pp. 190-91, ill.